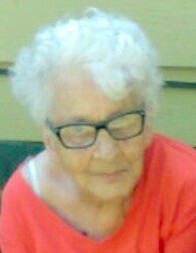 Frances Sullivan, 83, a resident of Enfield, Illinois, passed away Monday, April 1, 2019 at Deaconess Hospital in Evansville, Indiana. She was born September 28, 1935 in White County, Illinois to Archie and Wave Brandon. Frances was a home maker. Frances is survived by her daughter, Janet Burton of Mt. Vernon, IL; one sister, Vicky Brandon of Enfield, IL; eight grandchildren, eight great grandchildren, and many nieces and nephews. She was preceded in death by her parents, husband James Sullivan, three brothers, one sister and three sons: James “Oppie” Sullivan, Harold “Dink” Sullivan and Jeffrey “Moe” Sullivan. Funeral services will be held Saturday, April 6, 2019 at 2:00 p.m. at the Gholson Funeral Home in McLeansboro with Pastor Jacob Gray officiating. Visitation will be Saturday, April 6 from 12:00 p.m. until the time of service at 2:00 p.m. at the Gholson Funeral Home in McLeansboro. She will be laid to rest at the Enfield Cemetery in Enfield, IL.